In the website, I refer to the terms tendinitis, tendinosis, and tendinopathy. (They are alternatively spelled tendonitis, tendonosis, and tendonopathy.) Patellar -- or patella -- tendinopathy is also referred to as "jumper's knee." Tendinitis -- the (acute) early stages of the tendon injury when there is inflammation. During this stage, I'd focus on controlling the inflammation so it doesn't get worse. Treatments may include icing the knee and rest. Reducing walking and other exercise may be a very good idea. At some point gentle stretching and very modest strength training can be added. During the inflammation phase, I would not recommend eccentric exercise as it may worsen the situation. You should see a medical doctor if you develop tendinitis. Tendinosis -- Hopefully your tendinitis doesn't morph into tendinosis. For most people it doesn't. If you are careful during the tendinitis phase, you may be able to reduce the risk of the problem turning into tendinosis. When I refer to tendinosis, I mean a chronic condition where there is still pain, but no inflammation. If you believe you have had tendinitis for more than a year, it may likely be tendinosis and not tendinitis. 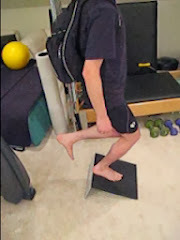 It is during the tendinosis phase that eccentric exercise may be helpful. Tendinopathy -- This can refer to either tendinitis or tendinosis and is a more general term.